Over the past week it's been heartening to hear numerous stories and anecdotes about our 41st president. He lived a magnificent life: full, varied, and vibrant. When we hear from the people that knew him, the remembrances were always about his character and nature. Thousands of tributes have poured forth for this accomplished, yet gentle man. 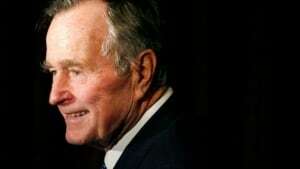 One person commented how President Bush grew up in a household where his mother wouldn't allow him to start a sentence with "I," so as to take the focus off of himself. Similarly, people of that builder or greatest generation were taught not to think of themselves first. Not to beat up on Millennials, but this generation is very well nicknamed the "me" generation. Wouldn't it be great to have more people achieve so much and yet remain so humble?